TTVJAudio Vinyl Zyme is the finest record cleaning solution we have come across. After using this cleaner for the last 10+ years and trying many others, I am convinced this is the one to use. Pops and ticks have disappeared from albums cleaned by other cleaners first. A must buy for the serious collector. An alcohol free cleaner that contains natural enzymes. These enzymes break down the protein/carbohydrate substrate where mold and mildew attach themselves to the walls of your record groove. These are the pops and ticks you hear. 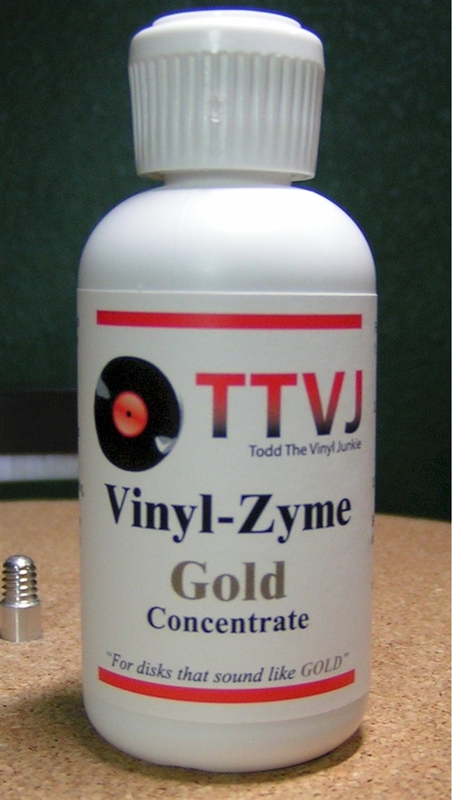 One cleaning with TTVJ Vinyl Zyme Gold and you will be sold forever on this product. I know I am!!! Use the whole 2 oz. bottle of concentrate mixed with 1 gallon of distilled water to make a gallon of Extra Stength Vinyl Zyme for records that are getting their first cleaning or are pretty dirty. This is what I use on all of my records for their first Vinyl Zyme cleaning. OR mix 1/2oz. of the concentrate with a gallon of distilled water and get 1 gallon of Regular Strength Vinyl Zyme. This is what I use to keep my records clean after a cleaning with the Extra Strength. Or better put, this is your maintenance cleaner.